"The application we're actively considering is eye surgery in which these devices are guided inside the eye toward the retina by a surgeon to inject drugs in retinal veins that are about the size of a human hair," said team leader Brad Nelson, professor of robotics and intelligent systems. 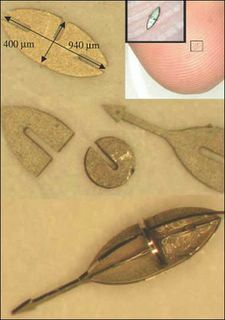 Barely a speck of a robot, the smallest devices Nelson and his team have built are about four hair-widths long and are made up of several components. The mechanical and electrical parts are cut and etched from pieces of nickel and assembled using methods similar to those used to design and make computer chips. this robot's power comes from an external magnetic field generated by a machine. For example, tuning to a 2 kilohertz frequency could vibrate a motor that extends a small syringe into a blood vessel. Tuning to 3 kilohertz could drive a pump that delivers drugs into the vessel. In lab experiments, the team successfully steered the micro-robot backward and forward through a water-filled maze that has channels about as wide as 10 human hairs and as deep as three hairs. Wow that was amazing and a very big help on the field of research and medicine..